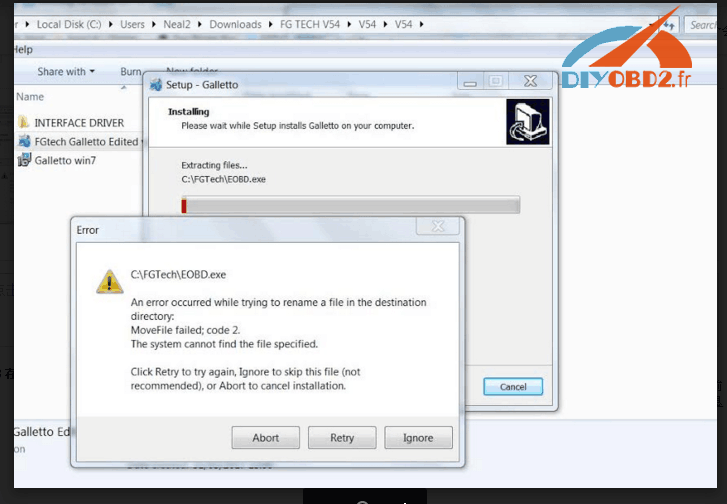 Run “FGTech Galletto Edited v1.0.exe” as an administrator. Important: Do not create a desktop icon and run the program yet. Next, connect the Galletto device to the power supply and then connect it via USB. The automatic driver installation fails. But do not worry, the installation is done manually. Right-click on the “Computer” icon and select “Manage”. As soon as the window opens, click on Device management and select the USB port “FGTech”. Here you have to click “Update driver software”. And then click “Browse the computer for driver software”, then “Select from a list of device drivers on the computer”, then “Have Disk” and “Browse”. Now look for the folder of “FGTech” on drive C. Here you open the folder “fgtech_new_driver” and select the following file: “fgtibus.inf”! Confirm everything, wait for the installation, and close all windows. Run “FGTech Galletto Edited v1.0.exe” again as an administrator. Important: Do not create a desktop icon and run the program yet. Run “Galletto win7.exe” as administrator. Create and install the desktop icon. If the installation is complete, start the program as an administrator. Ignore the next two windows with hints and confirm with OK.